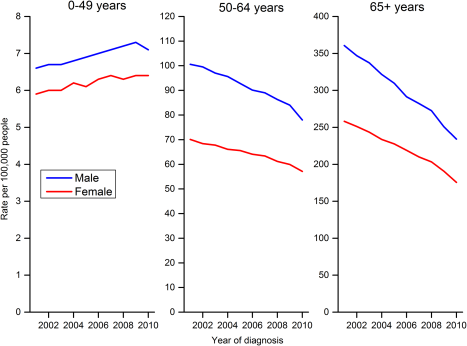 Recently Released Data show that new cases of colon cancer and deaths from colon cancer have declined significantly in the past decade. During this period 30% less people have developed colon cancer than in the prior decade. The largest decline has been in those over the age of 65. This coincides with a tripling of the number of seniors undergoing colonoscopy in the same period. Because colon cancers often originate in small non cancerous polyps periodic colonoscopy offers an opportunity to remove polyps before they become cancerous and to find colon cancers at an early stage when they are more easily treated and cured. Despite these encouraging statistics many people avoid colonoscopy for a variety of reasons. Many people fret over the prep which for the vast majority is no big deal. Others erroneously believe that that since nobody in their family has had colon cancer that they are not at risk. And while it is is true that an important minority of colon cancer has a hereditary basis (listen to Doctor Taubman’s Podcast On the Subject)- the vast majority of patients diagnosed with colon cancer do not have anybody in their family with colon cancer. While the present data is encouraging two areas of concern are emerging. First, while colon cancer screening usually begins at age 50 (or 10 years before the earliest case in the family), the incidence of colon cancer prior to age 50 appears to be slowly increasing for unclear reasons. Our western diet, sedentary lifestyle and associated weight gain may be contributing. Also colon cancer screening often stops when patients get into their mid seventies though many people nowadays are living a good bit longer. Certainly for those who have never had a colonoscopy and are otherwise healthy a one time colonoscopy at age 75 or beyond is reasonable and supported by the literature. Colon cancer remains the third most common cancer and cancer related deaths. The progress of the last decade is truly remarkable and a rare example of health care dollars well spent. However 23 million Americans between the ages of 50 and 75 have not been screened for this preventable cancer. Rather than rest on our laurels and celebrating a coalition co-founded by the American Cancer Society and the CDC has set its sights on increasing colon cancer screening from the present reported 55% of those aged 50 to 75 to 80% in the next decade. With colonoscopy becoming more accepted by the population, and insurance coverage becoming more universal that laudable goal should be within reach. I disagree with Dr. T that the prep is no big deal for most people. I hate it. I mean ‘HATE’ it. In fact, I don’t know anyone who likes it. The actual colonoscopy is a breeze after the prep. But, consider this, which is worse, the prep or colon cancer? I’ll take the prep any day. We all do things we aren’t fond of for our health. Do you look forward to a dental appointment or root canal for example? Not many people do but it’s worth the discomfort in the long run. So go ahead with the prep and get that colonoscopy. So you are not a happy camper for a day but think of how many days you would have to deal with colon cancer?